A proper planning is needed for every task. It should be effectively managed, monitored at each and every step. So you can easily locate mistakes, if any and rectify them to maximize the results. We are familiar with the term social media marketing. People promote contents and products across social networking sites for traffic and sales. Unlike the traditional way of marketing, it reaches a large group of audience at once. Marketers can canvas customers from other parts of the world just by sitting in front of the computer that has internet connectivity. Social media marketing is a difficult process if you are not using any proper tool to plan, schedule and manage the campaigns. The success of a marketing campaign depends on timely monitoring of the audience, user engagement and competitors. A good social media marketing service should provide all these features to its subscribers with access to all leading social media accounts. We covered some popular social media management tools in recent posts. Hope you have read them. Agora Pulse is a perfect tool for marketers. It is simple, easy to use & comes with an attractive interface where you can schedule and monitor campaigns without any third party help. It allows you to connect multiple social profiles with advanced features like social inbox, monitoring, reports, competitor analysis, team management, and others. After signing up, go to Dashboard > Accounts > Add to connect your social media accounts which can be used for promotions. It supports Facebook and Google+ pages & Twitter, Instagram and LinkedIn profiles at this moment. You will be able to integrate with Facebook groups and Pinterest within a few weeks. Once you finished the basic settings, open Chrome web store and install Agora Pulse extension to publish contents anywhere on the web. It lets you schedule the contents via dashboard and browser extension. If you are on the dashboard, click the Publish button on the top right side. It will show profile pictures of all your connected accounts. Choose desired profiles to post and enter your message, link URL in the content area. Agora Pulse will automatically fetch the featured image from your post and will show it in the preview pane. It also allows you to replace the default image with customized images and videos. Check your post preview by going to the respective social profile tabs on the right side. When do you want to publish the content? You have three options. You can either publish it immediately or schedule for a later moment. Add to queue is another option, that will automatically send your posts to social media accounts on the predefined times set by you. For scheduling, choose schedule option from the bottom panel and click Next. Now it will allow you to set date and time for the post. When finished, click the Schedule button once again to save the post. Agora Pulse is a single place where you can manage campaigns, read and reply messages, monitor real-time social media activities, discover the best followers and build a powerful social media community around you. It provides in-depth metrics on your campaign growth, audience, user engagement and much more. Publishing calendar is another major part of the tool. 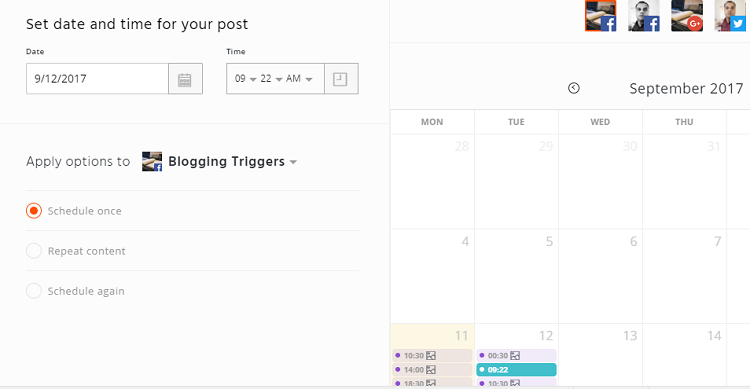 It will fetch your published, scheduled and queued contents on social profiles even outside of Agora Pulse and will show them in a calendar view. You can easily manage, copy and reorder posts using drag and drop feature. Additionally, it provides a bunch of free tools for Facebook pages to improve their social media reach and user engagement. The page owners can run quiz contests, personality tests, photo contests and collect votes to know the audience’s pulse on their favorite app, the person of the year, etc. It also allows you to compare your own Facebook page with that of competitors and monitor the level of engagement, interactions, fans growth on a daily basis. Agora Pulse works on web, smartphones, and tablets. It has dedicated apps for iOS and Android devices to use the service anywhere on the go.